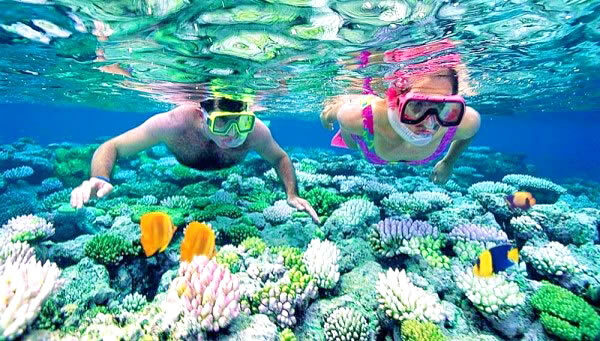 House reef snorkelling is a great bonus to your Maldives beach experience. The best house reefs for snorkelling in Maldives are generally readily accessible; you only need to don a mask, a snorkel and fins, and head into the water to enjoy beautiful underwater wonders teeming with abundance marine life. This unique area in the heart of the Indian Ocean attracts sun and sea lovers from all over the world who want to discover the best coral reefs. To fully enjoy the art of snorkeling, you must choose the right spot. All resorts offer snorkelling , but that may be a $20 boat trip once a day, at worst. The fair resorts put on several free snorkelling trips a day if their house reef is not accessible. . The Maldives made up from the blocks of coral that have grown tall enough to break the surface (and collect sediment enabling plant growth, etc) ... the "house reef" is the living part of this coral block below the surface or in the tidal zone. The house reef is that area close to the vertical drop off where the coral begins to aggregate in a kind of coral garden teeming with marine life and colorful fish. The shallow water enclosed by the house reef also serves as a large natural swimming pool and protects swimmers from the ocean waves and strong tidal currents outside the reef. By definition, all maldivian islands have a house reef , but we most often talk about an island "having a house reef" if this living part is easily accessible to divers and snorkellers , instead of a large lagoon or not much notable coral growth. an "island with a good house reef" in forum jargon , would be one where you could expect to snorkel or dive off the beach or jetty. Whether you are a snorkeller or a diver, Maldives has a lot to offer. The house reefs are the best snorkeling sites. Thanks to the resort’s house reef, ocean discovery is right here on your doorstep. In fact, a some house reefs top are so prolific that many photographers run out of dive time before they run out of subject matter. The drop off can have an amazing features like caves, overhangs and canyons. The deeper, the more differences in coral shades, and other species of marine life become clearly visible. The house reef can be explored at any tide by night or day. There are periods of slack water at both high and low tide, while mild to medium currents can run along the outer reef slope during tide changes. This allows divers the opportunity to drift along the reef face at various speeds while exploring its beauty. At high tide you can enter or exit the water at numerous points along the beach. When currents on the house reef are flowing on the stronger side, the resort's dive center team will make recommendations for alternatives that might be more suitable to each individual guest. In case you feel a little bit worried to go out snorkelling by yourself, the resort's snorkel guides are always happy to take you for the guided house reef tour. If you feel the deeper waters are not tickling your fancy, you can stay in the shallow lagoon just off the main beach and try to spot a turtle or two (they don’t mind the occasional selfie, but make sure you respect their space, and never, ever touch them!). One doesn’t necessarily have to join a boat excursion to experience good snorkelling and diving. The most of house reefs is easily accessible from the resort’s beach or jetty – don your equipment and get ready in the shade of the hut and off you go into the warm waters of the Maldives to experience the magic that lies beneath the surface. If the convenience alone doesn’t make you want to jump onto a plane right now, let us tell you more about what what you expect to see on Maldives' house reefs. Tiny, colourful nudibranchs and flamboyant mantis shrimps hide amongst the corals, schools of colourful reef fish move past hiding moray eels and resting stingrays. If you’re lucky, you may even spot cruising eagle rays and reef sharks swimming along the edge where the bottom starts to drop off. The house reef is also home to the magnificent octopus, one of nature’s more curious creatures. Fun fact: Did you know that octopus change the colour and texture of their skin to camouflage themselves into their environment? Their skin colouration also reflects their mood. They are usually brown, but turn white when afraid, and red when angry. If you feel that you need another type of adventure, don't fret: there is also a shipwreck on a some house reefs, at which you often see a big napoleon wrasse, surrounded by the resident school of bat fish. WHICH RESORT HAVE the "BEST" HOUSE REEF SNORKELLING? The best house reefs are easily accessed, stunning house reefs make these 10 islands the icing on the wedding cake. Some you can snorkel the whole way round: Diamonds Athuruga has a seamless drop-off with great coral where whale sharks have been sighted; Eriyadu’s edge is just a short swim in any direction; and Vilamendhoo’s close-by channel attracts spectacular predators. Bathala's position at the atoll edge brings snorkellers face to face with everything from turtles and tuna to eagle rays and even hammerhead sharks. Angsana Ihuru was named the best house reef in Maldives, with an embarrassment of fish species and living coral. Equipment at Hurawalhi comes within the all-inclusive deal, and there are guided snorkelling trips all day. The new water villas at Lily Beach make access to their coral gardens a matter of a few steps and a few metres swim.